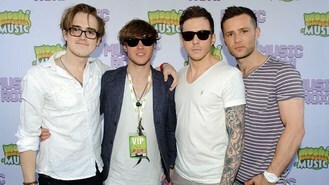 McFly have been added to the bill of the free Olympics concert in London's Hyde Park. The quartet - Tom Fletcher, Danny Jones, Harry Judd and Dougie Poynter - will play the BT London Live show on August 4. Finals of the women's 100m final and women's triathlon are among the highlights along with a number of swimming and rowing finals. Westlife's farewell concert is to be screened live to cinemas in the UK and Ireland, allowing fans to view their final moments. Kylie Minogue has celebrated her 25th year in pop music - and her birthday - with an Outstanding Contribution gong. Kasabian have announced their biggest ambition yet - to perform a gig in space. Nicole Scherzinger is to return as the latest guest judge for The X Factor auditions. One Direction are reportedly set to ramp up their security after Liam Payne and Niall Horan were knocked over by fans in New York. Professor Green has quipped that he would put the stars of The Only Way Is Essex in prison if he was Prime Minister. Kylie Minogue's guest appearance failed to be so lucky for BBC1's The Voice as the programme had its worst results show audience so far. The Saturdays' Rochelle Wiseman had a hen party to remember.